-We ship all orders (US and Canada only) by US Post Office, using the best available rate. -We will ship on the same day or the next business day if the payment for the order is before 3:00 pm Central Time. Business hours are Tuesday-Friday 10am-4pm and Saturdays 9am-2pm. We are closed Sundays and Mondays. -There may be a small handling charge on all shipped orders for items other than thread. -If you need an accurate shipping cost please contact us and we will happily provide a shipping quote for your order. E-mail us at kssewing@live.com. -There are no returns, refunds, or exchanges on cut fabric, books, videos, quilting patterns, clearance/sale/discounted items and kits. -You may return unopened product within 30 days of invoice date for a refund of the purchase price. -Exchanges only for store credit after 30 days. -No credits issued on products after 90 days. -Shipping charges both directions are never refunded or credited. 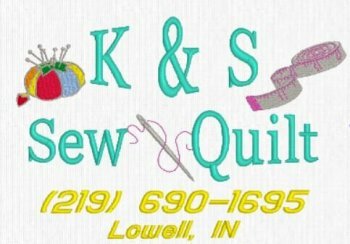 -We will not sell or share any customer information, outside of K&S Sew-N-Quilt, including your email address. -You may occasionally receive information via USPS or e-mail from us.